Lord, please use this young man to save babies. The young man in the ad below lives with a developmental disability. 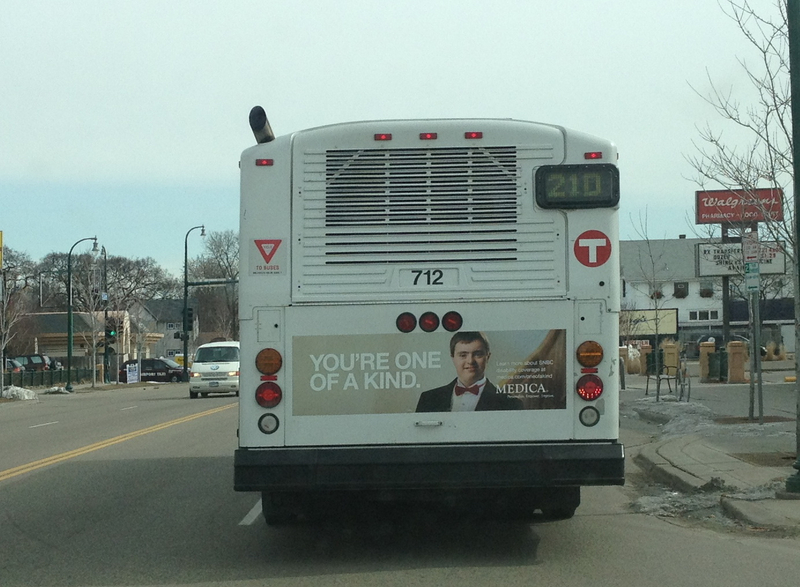 The advertisement reads: You’re one of a kind. Learn more about SNBC disability coverage at medica.com/oneofakind. There’s more information about the young man at Medica’s website. The newest Planned Parenthood clinic in Saint Paul is ‘conveniently’ located on major MTC bus lines and the new light rail system. I know Medica and their ad agency, LEVEL, didn’t intend that bus ad to be used in the fight to protect children with disabilities. But wouldn’t it be great if God used it to wake up mothers and fathers to the inherent dignity and humanity of their unborn children, even those diagnosed with disabilities? Lord, please, use even this bus ad to break through the darkness and the lie that children are expendable and a burden. Use Peter to save more babies, for your glory and for our good. I clicked on the link to the Medica site and read this young man’s story. There is another story on the site about a woman from Duluth named Amy whose disability means she lives with serious, increasing, debilitating pain. Amy is a Christian and writes freely about her relationship with Christ on her website. God gets glory even through the choice of whose stories to feature!